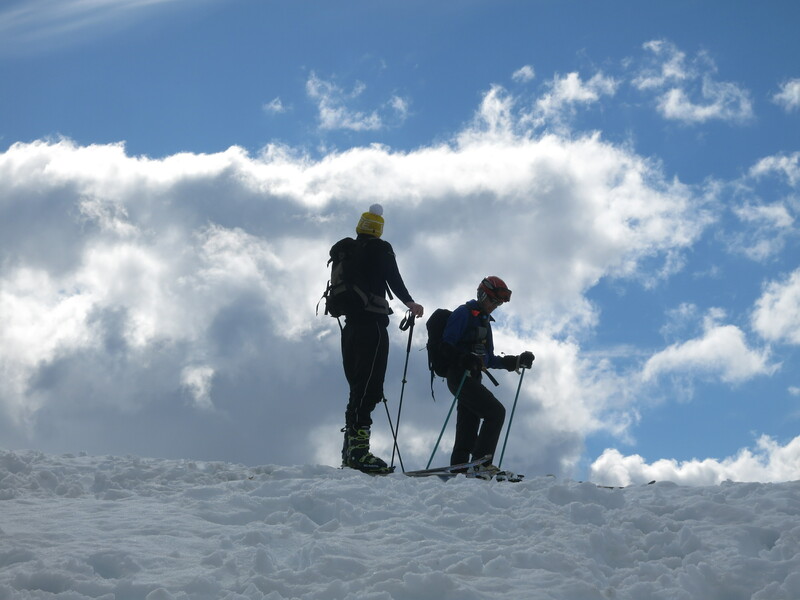 On June 3rd a crew of 9 organized by Roland Burton drove, hiked, snowshoed and skiied up to Brew Hut to replace the solar panel that had been ripped off during the winter previous. Shu Yu Fan drove one car and Roland drove his trusty Jeep. At the FSR, Roland shuttled us up almost to the trailhead; had to stop about 500m short to remove a tree fallen across the road. The trailhead at 1100m was clear of snow but we ran into soon enough. By 1200m those of us who had skis had our skins on, albeit the snow was littered with soft debris like pine needles, moss and cones. The weather was generally overcast with sun splotches coming through here and there. Harlin Brandvold and I both expected to be getting wet that afternoon with rain but we were horribly mistaken. By the final stretch, the sun decided to shine through to give us a wonderful welcome to Brandywine Bowl with brilliantly clear skies. Soon enough, so was our skin. I don’t know about Harlin, but I look a tomato and feel like a potato.. I have a feeling he might feel the same way. Once settled at the Hut, Phillipe LeBillon, Arron Yeung and I worked on installing the solar panel while Harlin taught Shu Yu and Chelsea Brager how to split large logs. Roland with his infinite wisdom (and hobbies) had bought and prepared all the materials to fix the system, He had crafted a wooden board such that the solar panel could be secured using washers compressed onto the edge of the solar panel frame via screws embedded in two lengthwise pieces attached to the wooden board. Roland had thought to drill holes around the edge of the board such that it could be secured to the metal plate which the old solar panel resided. The old solar panel had no “mechanical” fastening, but instead relied on some sort of black tarrish roof sealant or cement. This was scraped off before we attempted to fit the wooden board. Unfortunately, the holes Roland had drilled on the wooden board did not line up with the holes in the metal plate and some improvising was required. Phillipe drilled some holes through the wood with some pointy screws such that each of the four corners to the metal plate could be connected to the wooden board. There were 10 holes in the metal plate that could potentially be bolted to the wooden board but the lack of screws and the difficulty of drilling the holes with the screws without splitting the wood made us decide that four was enough. Unfortunately again, the screw in the bottom left corner didn’t have a hole punctured into aluminum corner paneling of the Hut and so once again we had to punch the hole with some amount of effort. The right top side of the board, connected to an aluminum strip that stuck out from the Hut. This allowed the solar panel to face directly south rather than flush with the Hut, south-south-west. This is a favourable position as it captures sunlight during peak hours at a favourable angle and as such, can generate a fair amount of electricity on a clear day. 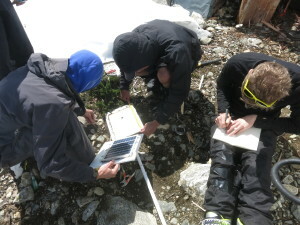 Phillipe, George, and Aaron work on the solar panel installation. As of now the solar panel produces about 20V but the LED light in the Hut requires 12V. According to Roland, this discrepancy in voltage means that a sizable portion of power is lost. From what I understand, the current set up includes a 1 hour timed on/off switch as two buttons, eight AA Panasonic batteries, and a transformer to protect the batteries from the voltage difference. Without the protection, water is deconstructed into gases and then lost, thereby reducing the charge of the batteries. On the ceiling, there are metal reflectors that help to redistribute light that shines upwards back down and around the Hut. On the back of the metal plate, a small plastic cable box is present. The cable box holds the connection between the wires of the solar panel and the main wire to connect to the batteries. The connection is formed by twisting the exposed wires together slightly and then twisting them further with an electrical connection cap to ensure a good connection. After the solar panel was fully in place and tested to be working, DAP Silicone Plus was used to seal the cable box back (which could be removed with two screws) and the edges of the solar panel along the wooden board. Unsure how much is left and if more will be needed to be purchased for the Harrison installation. While we were busy with the solar panels; Chelsea, Shu Yu and Harlin were busy chopping wood for the nearly empty woodshed; Lucy Buchanan-Parker, Harlin and Chelsea were inspecting the outhouse; and Alberto Contreras Sanz cleaned up inside the hut before taking a nap alongside Roland. When we arrived at Brew it was quickly apparent that either something was gravely wrong with the outhouse, or weather had been so bad with winter trips this year that no-one has been able to find the outhouse when the need (or get there in time?). Excrement was scattered in the snow off the West side of the Hut. As most who have done glacier trips know, what goes in the snow, typically stays in the snow. The outhouse crew were able to clean some of it up, but it is likely there is still more that we didn’t get to. At the outhouse, they discovered that the pit was filled with liquid. Our hypothesis is that over the winter the contents of the pit, continual froze, thereby increasing the volume of contents within the pit. Using a makeshift probe the crew discovered a solid surface about 3’ down which wasn’t deep enough to be the bottom of the pit. Additionally, the solid surface was at a uniform depth whereas the pit is uneven at the bottom. They weren’t able to reach any farther with the probe but their guess is that there is still a layer deeper in the pit that is still completely frozen and is blocking the liquids escape. We are hoping that with the arrival of summer that the contents of the pit will re-liquefy, the liquids will be able to drain from the pit naturally and it will no longer be full. It further was noted that people had been burning their toilet paper in the plastic poop bin used for emptying the pit rather than the proper metal bin. I am thinking that maybe we should hide these “poop tools” underneath the Hut such that they won’t accidentally be used for things they shouldn’t (such as drinking water…yes…apparently this has happened according to Roland). The general consensus reached was that the Scottish Outhouse Brigade should be consulted on further steps. Phillipe and George ponder the views. After the completion of all these various tasks, Roland revealed a “sacrificial religious rabbit” (chocolate bunny) which was devoured fervently. While consuming copius chunks of clerical chocolate, Phillipe, Alberto and I began to talk about attempting Keg Peak. Alberto attempted to convince Lucy to join us, but she was reluctant due to fatigue. I granted her a way out when I realized my stock of AAA batteries had been depleted by a friend who had forgotten his batteries on a previous trip… Oh how much fun Roland had when his exact words to me before heading out on this trip were “You better not forget your batteries for this toy”. Lucy lent me her transceiver, or as Roland might refer to them confidence boosting doohickeys, and the three of us headed out. We traversed across from Brew to the North West and decided to ascend Hops Peak and follow the ridge line rather than traverse through Brandywine Bowl; The cornices were quite large still and significant crack lines were visible. We found a safe route under the North West ridge of Hops Peak and skied down to the saddle between Hops Peak and Keg Peak. The snow all throughout was hard but very beautiful. Rain run-off lines ran in roughly equal spaces down the slope and showed off the minute but smooth contours of the slopes. From the saddle we continued up the South East Ridge of Keg Peak with some amount of difficulty as the slope was treed, steep and undulating near to the top of the ridge. We would later realize that if we had stayed further to the South West while ascending the ridge we would have had a much easier time skinning up the more open and more gentle slope. At about 7:40pm we reached an elevation of 1770m we knew we were close to the peak but we didn’t know what the terrain would be like for the last ascent and we were nervous about losing daylight. Little did we know that we were less than 100m horizontally and 40m vertically from the top, but alas we turned around. In hindsight, it might be easy to say we should have pushed to the top, but I think with the information we had, we made the right choice. You can see in the map below just how close we were. The sun had been shining upon us while skinning up and so on our descent we were pleasantly surprised with soft spring snow and a wonderful ski back down to the saddle between Hops and Keg. From the saddle we entered into Brandywine Bowl and skinned back up to the Hut. I sat outside, made dinner and watched the mostly clear horizon; the sun positioned behind Keg had decided to hide behind the only cloud in the sky. This was probably a good thing for my nearly complete sunburn but it still would have been nice to have the cloud anywhere else but where it was. Although this darn cloud obscured the sunset, it did not obscure the beautiful colours that light up the rest of the sky. Checking the time after dinner revealed the surprise that it was already 9:30 – a due reminder that the longest day of the year is fast approaching. Back in the Hut, Chelsea, Harlin and I enjoyed a game of crib to the tune of the now functioning solar powered light. 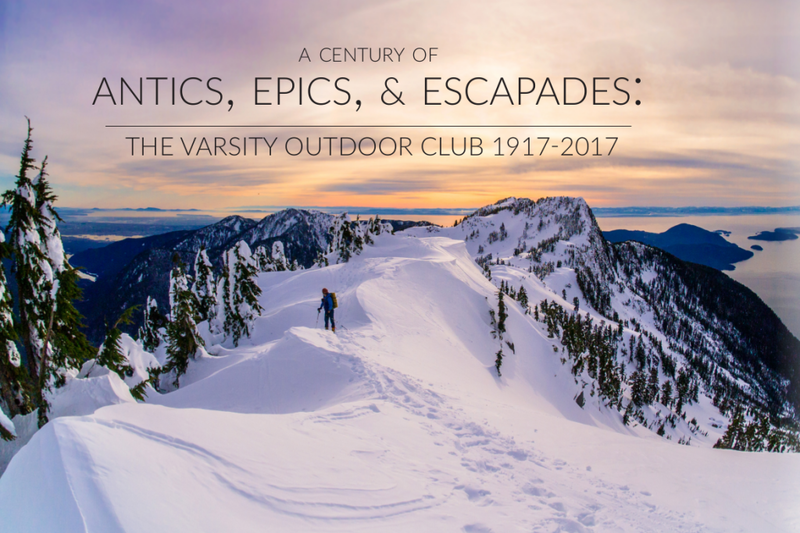 Aaron, Shu Yu and Lucy dutifully read VOC journals past and Roland had cozied up in his sleeping bag awaiting the light, which he brought everyone up to fix, to go out. At 11:00pm the light went out coincidentally after 1 hour of service. The timer is set to shut off the light automatically after one hour but in this instance, the 1 hour mark also happened to coincide with the depletion of about 1-2 hours of sunlight from the new solar panel. Chelsea won her very first game of Crib and shortly thereafter the Hut fell silent. By the time I had mostly finished my notes while concurrently going through my porridge, everyone was up and Lucy had finely detailed everyone’s exit strategy from the Hut down to the minute. At about 9:15, Alberto, Lucy and Phillipe were ready to go summit Brew and I tagged along. Their plan was to first summit Mount Brew then find a way over to Malt Peak. I decided to head back down to the Hut to finish my notes while Lucy did laps on the Bunny Hill and Alberto and Phillipe explored Mount Brew. While we were ascending Brew, Aaron, Harlin and the other non-skiiers applied the silicone sealant to the solar panel and tidied up the hut before starting their trek back to the Jeep. I stayed behind at the Hut and made soup while waiting for the skiiers to return. When Alberto did return he managed to accidentally close the padlock to the donation box without it being on the donation box. The combination had left down the mountain with Roland but I had luckily retained Harlin’s phone number before they went out. At that moment, I was very very thankful that Brew somehow gets cell coverage. With the donation box locked and the hut tidied, the skiiers set off back to the trailhead. The snow was still hard and hadn’t quite softened up enough, but it was still enjoyable. Alberto and Lucy spotted a coyote briefly; it seemed not interested in taking us for snacks. We were back at the trailhead within an hour and a half and just in time to talk about frogs turning into snake with Roland and two dirt bikers roaming the roads. Soon enough we were all back in our respective cars sailing away along the sea to sky back to our secondary homes. This entry was posted in Hike, Huts, Ski, Trip Reports, Workhike. Bookmark the permalink. Was up at Brew this past weekend. The solar panel is adorable. Also, everything is still 90% snow covered up there.